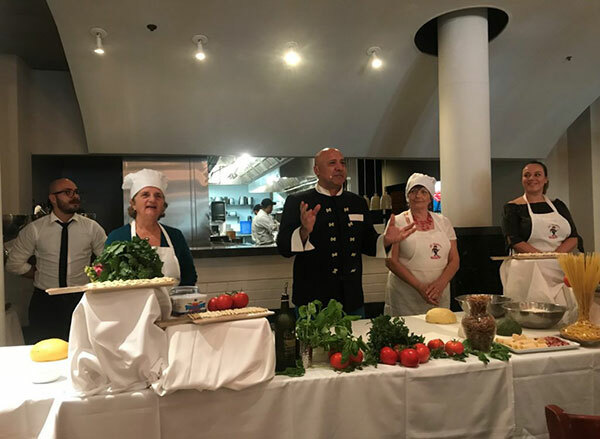 Washington, DC – October 22, 2017-Chef Luigi Diotaiuti1 opened the doors of his newest restaurant in Washington, DC, Aperto3 (Italian for OPEN) to demonstrate PASTA LAB to an audience from the Italian Cultural Society4 (ICS) of Washington, DC. Chef Luigi Diotaiuti demonstrated Pasta Lab, a project from his newly formed non-profit organization, Basilicata: A Way of Living. Pasta Lab’s mission is to help preserve Basilicata’s distinctive pasta-making techniques and customs. In Basilicata, Pasta Lab pairs professional chefs with talented home cooks, mainly grandmothers, who are often the custodians of cooking traditions. Frencesca Casazza, Executive Director of the ICS, along with members of their BOD, including President , Luigi M. DeLuca and over 70 of their members attended Sunday’s Pasta Lab. The ICS promotes Italian culture and language through special events. Casazza particularly loved working with Chef Luigi for this event because “we share the same passion to promote Italian culture and lifestyle”. “For 40 years, I have provided the distinctive, dignified authentic cooking of Italy…food, so simple, pure and sparkling fresh that it nourishes your body and embraces your soul” said Chef Luigi as he served ravioli with burrata, trofie al pesto and laganelle Lamb ragù to his guests. Born in Lagronegro, Basilicata, interpreting and preserving the region’s culinary traditions has been Chef Luigi’s lifelong quest. Holding dual citizenship in Italy and the US, Chef Luigi is passionate about giving back to both communities, which he considers home. In the United States, he is a member of the American Chefs Corps Network with the U. S. Department of State. When he is not cooking for celebrities like Italian Prime Minister Mario Monti, Former Secretary of State, John Kerry and actor George Clooney, Chef Luigi makes frequent appearances on US and Italian television and has been featured in countless print media articles. Chef Luigi is a member of The James Beard Foundation, The Diplomatic Culinary Partnership, Slow Food DC, The International Association of Culinary Professionals, the Culinary Historians of Washington, The Federation of Italian Cooks, and is affiliated with the National Concierge Association and Ciao Italia. In 2017, he was named “Ambassador of Basilicata’s Cuisine in the World” by the Federation of Italian Cooks. “Cozy, warm, and joyful” are the words most often used to describe Washington DC’s “most authentic” Italian restaurant. A celebrity favorite for decades, Al Tiramisu provides all patrons a consistently exciting cuisine, allying authentic Italian fare with elevated touches. It is for this reason that they were awarded the coveted “Insegna del Ristorante Italiano,” the seal of approval by the President of Italy. In 2013, Al Tiramisu was also awarded Slow Food DC’s Snail of Approval award. Aperto features two private rooms, the perfect location for your next exclusive Italian event, as well as sidewalk dining. Aperto features reinvented recipes that are easy on both the environment and the waistline. The Italian Cultural Society of Washington D.C. is a 501 (c) (3) non profit association, which promotes the Italian Culture and Language, through monthly cultural meetings (varying from wine tastings to book presentations, to panel debates on Immigration, EXPO 2015, music and history related events, etc. ), special events and scholarship awards. The main expression of their mission is the Italian Language Program, founded in 1974, with contributions from the Italian Ministry of Foreign Affairs. The ICA promotes not only the Italian language, but the Italian tradition, tourism and “Made in Italy” products.